Home → Uncategorized → Campbell Cunningham Laser Center Celebrates 20 Years! Drs. Philip Campbell and Les Cunningham Continue to Advance Vision Technology in East Tennessee. Two decades after founding Campbell Cunningham Laser Center, the value of LASIK vision correction is even clearer. And for Drs. Philip Campbell and Leslie Cunningham of the Campbell Cunningham Laser Center, that’s very rewarding. Drs. Campbell and Cunningham were the first Knoxville-area Ophthalmologists to perform LASIK vision correction, pioneering a technology that has helped East Tennesseans see better and have the visual freedom to enjoy an active, more productive life. Today, LASIK vision correction in Knoxville and East Tennessee is dramatically different and enhanced from its early days. And while patients two decades ago still reap the benefits of LASIK surgery, today’s LASIK allows totally customized procedures for every individual—in fact, for each individual eye. 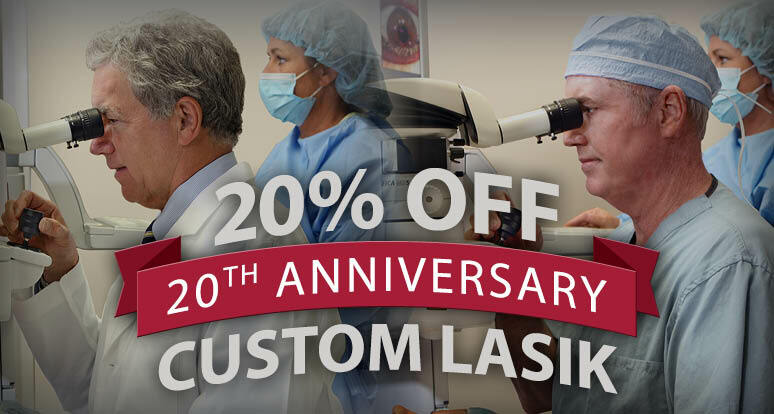 To celebrate, Campbell Cunningham Laser Center is offering a 20% discount on Custom LASIK for a limited time. Those interested should call (865) 588-EYES to schedule a Free Consultation. Or, [CLICK HERE] to request a consultation online. This offer is for a limited time, so patients should call soon. Some restrictions apply. The system used at the Campbell Cunningham Laser center is the same iLASIK technology used on military fighter pilots, NASA astronauts, emergency response workers, and other people in professions where vision is critical. In fact, to read about the experiences of many Campbell Cunningham Laser Center patients [CLICK HERE}. The Campbell Cunningham Laser Center continues to invest in advancements in LASIK technology, ensuring that East Tennesseans continue to get the best possible LASIK vision correction available. A commitment to the best technology and the best staff is the reason Drs. Campbell and Cunningham have performed more LASIK procedures than just about any other practice in East Tennessee. Campbell Cunningham Laser Center is part of a practice that has served the area since 1952. Drs. Campbell, Cunningham, Taylor & Haun lead a group of doctors and staff that treat eye diseases including cataract, glaucoma, macular degeneration, dry eyes and more. The practice is also home to a medical retina specialist and optometrists who visit their offices in Knoxville, Farragut, Sevierville and Maryville. To schedule a Free Consultation with Campbell Cunningham Laser Center in Knoxville, Maryville or Sevierville, call (865) 588-3937.